This year Passion and Cooking will celebrate Christmas with Pandoro, the “golden cake”! Pandoro and panettone are the most popular sweets during the winter holidays. While panettone is a native of Milan, pandoro is from Verona. It is traditionally shaped like a frustum with an 8 pointed-star section and is served dusted with powdered sugar (my kids like to be the ones to put on the sugar). The dough is very soft and the taste is delicate and refined. 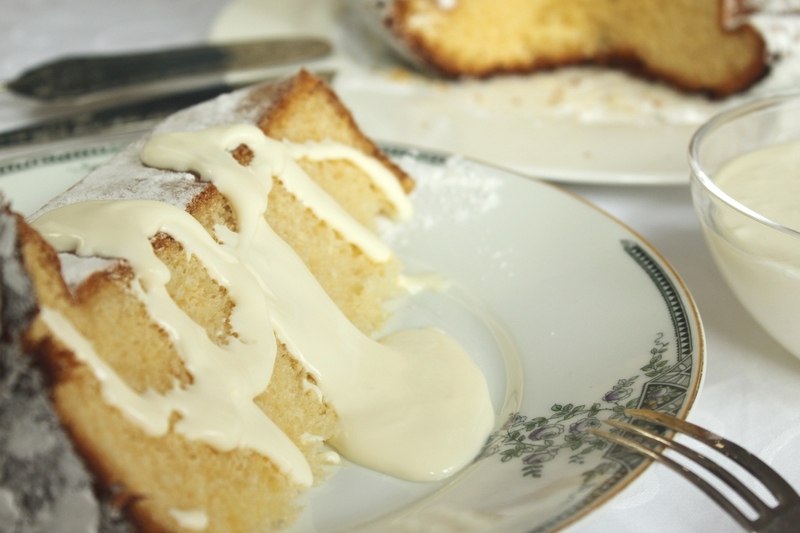 Pandoro can be traced back to the 18th century to the rich Venetian aristocracy. Although some people recognize the similarity with the French brioche or with the ” Pan di Vienna”, pandoro seems to have been first produced on October 14, 1894, when Mr. Melegatti obtained the patent for a procedure to be applied in producing pandoro industrially. From this moment on, and considering the similarity with the Nadalin (a typical sweet from Verona), Verona is now universally recognized as the home of the original pandoro.The preparation technique is quite complex, so I suggest buying a good pandoro and enjoying it with a delicious homemade cream. 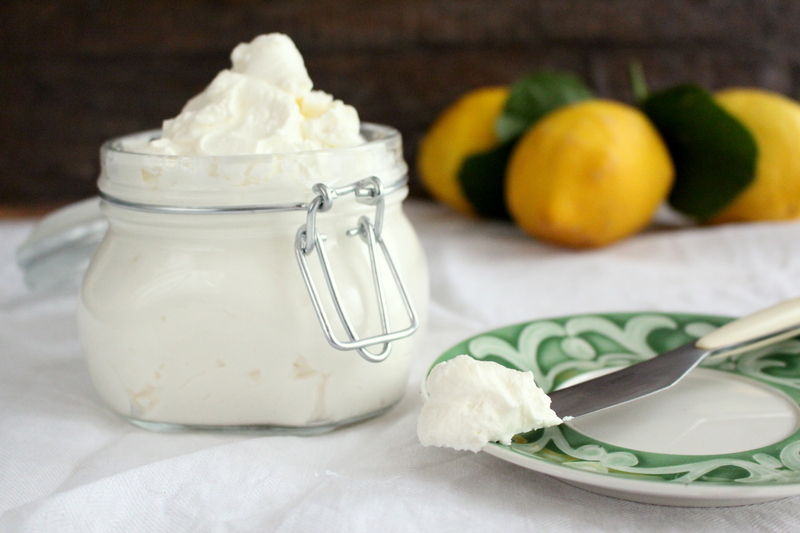 I love the combination of citrus and soft sweets such as panettone and pandoro, so I propose this fresh and aromatic Limoncello cream, made with the legendary Limoncello of Sorrento, milk, cream, sugar and mascarpone cheese, the king of cream cheese! 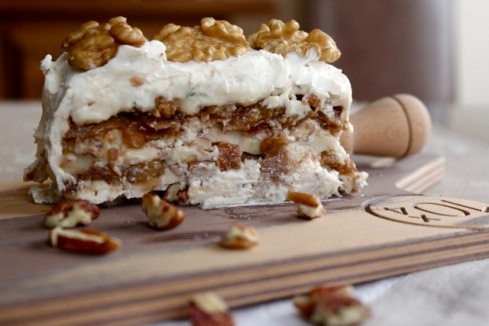 In a few minutes you will have a delicious and rich cream to garnish your slice of pandoro. A helpful tip is to gently heat the cake for about 15-20 min. (for example on a steam radiator) and to sprinkle with powdered sugar to get the snow effect before serving. Wishing you all a delicious Christmas! 1. In a medium saucepan heat milk, cream and sugar for 1-2 minutes until sugar dissolves. Cool completely, add Limocello and lemon zest. Set aside the Limoncello cream . This is a simple, simply delectable recipe that you can make as a tasty appetizer to serve in a special occasion. This is certainly a Mediterranean-inspired dish, a succulent combination of flavors, creamy and caramely, that you can easily get addicted to. The date tree originated around the Nile and Euphrates rivers of ancient Egypt and Mesopotamia. Now, however, the date palm grows in warm climates on all continents. Wonderfully delicious, dates are one the most popular fruits, packing lots of fibers, vitamins, antioxidants and minerals; they are an excellent source of iron. I love dates: by themselves, stuffed or in sweets. 3. 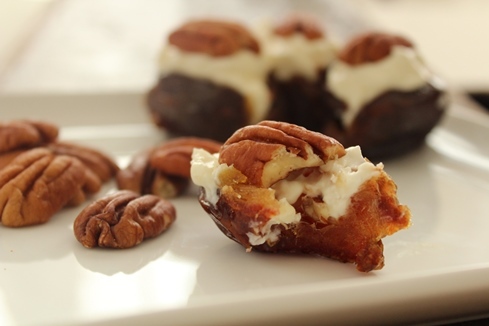 Fill center of each date generously with the mascarpone cheese mixture and place a pecan halve over the filling. 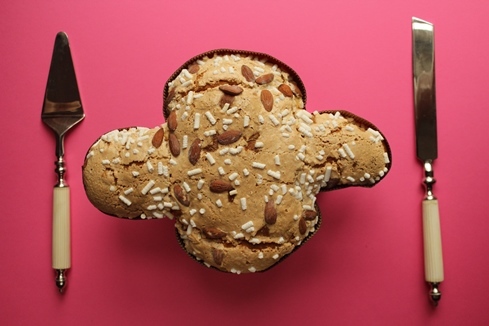 If you have ever celebrated Easter in Italy, you may have tasted our Colomba di Pasqua (Easter Dove). This is an Italian dessert only available at Easter, something in between a cake and a sweet bread loaf. The particularity of this cake is that it is shaped like a dove, the symbol of peace and rebirth. In the Catholic tradition it also symbolizes the Holy Spirit. The cake is very soft and the ingredients are simple, flour, eggs, natural yeast, butter, sugar and candied orange. The dough is shaped into a dove, glazed with a shiny coat of sugar syrup, coarse sugar and sprinkled with almonds before baking. This is the traditional recipe, but nowadays many variations are available, such as glazed with chocolate or filled with creams, and without candied fruit. Colomba traces its origins to the middle of the sixth century. According to a legend, King Alboin conquered Pavia the day before Easter, and a dove-shaped cake was offered to him as a sign of peace. A more realistic story, though, is that at the beginning of the twentieth century the Milanese company Motta started producing an Easter version of Panettone (Christmas cake). You can enjoy it with sparkling sweet wine such as Moscato d’Asti or sweet Passito wine from Sicily. Just like Panettone, it can be served plain or with mascarpone cheese cream flavored with different fruity liqueurs. One of my favorites to use is Limoncello, a delicious after dinner digestivo, frequently served in Italy and Italian restaurants, you might have tasted this delicious liqueur (served chilled) made from Sorrento lemon zest. This liqueur has a very fresh lemon citrus flavor that blends extremely well with the creamy taste of mascarpone and the sweetness of Colomba. Enjoy it and Happy Easter! Buona Pasqua! 2. Place the mascarpone and sugar in a medium mixing bowl. Use electric mixer to whisk for 1 minute or until sugar dissolves. Then add the cream-liqueur mix. You can serve the mascarpone either on top of the Colomba slice or aside. Gorgonzola terrine is an elegant recipe that you can serve at a buffet or as an appetizer, either with crackers or Italian ciabatta bread, and accompanied by nice glass of fruity white wine or an aged Port wine. This delight is also suitable as a cheese course in an important dinner. The pungent and distinct Gorgonzola flavor blends well with the sweetness and tenderness of the figs and the crunchy flavor of the nuts. This is a rich recipe, but there also a healthy side to it, of course!!!!. In fact figs are rich in fiber, vitamins and minerals while walnuts, in addition to vitamins and minerals, also pack high amounts of protein and omega-3 fatty acids, which as we know is beneficial to keeping your heart healthy and your cholesterol low. (At least this is something to balance out the gorgonzola!) With Italy’s reputation as the country of love and passion, it’s no wonder that a popular legend ascribes the origin of Gorgonzola cheese to a love story. One evening a young boy working as an apprentice in a dairy factory neglected his job, because he was “distracted” by a visit from his girlfriend and forgot to tend to his daily task. The next morning he found the milk curds covered by mold! He tried to cover his negligence mixing the curd from the day before with a new batch. He didn’t get rid of the mold, but the result was a new cheese never produced before and that now enjoys a solid and devoted following. This is, of course, only a legend to lend a little extra passion to this delicious cheese, which is made by adding a species of mold to fresh curd from whole pasteurized cow’s milk. It was already being produced in the Middle Ages, and its name comes from the town of origin, Gorgonzola, to the east of Milan. Nowadays several cities in Lombardy and a few in Piedmont are the main centers of Gorgonzola production. During these cold winter days I would also suggest enjoying sweet Gorgonzola spread on warm polenta. (for more on polenta, see the Brasato al Barolo con Polenta recipe https://passionandcooking.wordpress.com/2012/11/13/brasato-al-barolo-con-polenta-breased-beef-in-barolo-wine-with-polenta/ ). 6. Let it rest for 10 minutes at room temperature, then serve in slices. 2. Use an electric mixer to beat for 1 minute or until sugar dissolves. Stir in the liqueur. Depending on the type of mascarpone cheese, you might have to add 2-3 tablespoon of cream to make the mascarpone cream smoother. You can serve the mascarpone either on top of the Panettone slice or aside, decorating with some mandarin or orange zest. Tiramisù, arguably the most popular Italian creamy dessert, combines the flavor of mascarpone cheese, coffee and savoiardi cookies. The name literally means “pick me up”, metaphorically “make me happy”, and usually the diner’s expression when eating it betrays this emotion. The “pick me up” may refer to the caffeine in the espresso and the effect of cocoa used in the recipe. The name may also have another meaning; it is commonly thought that this dessert is stimulating and aphrodisiac! Tiramisù is not an “exotic dessert” and is not even too difficult to make. My own tiramisù recipe is a very light (no raw eggs and no cream), but at the same time it still has a smoothy and creamy texture. One secret is to use very good, fresh mascarpone (if you can not find fresh mascarpone, I recommend the brand “Galbani“) and to prepare the tiramisù one day in advance. If you are reading this recipe, you may have tried traditional tiramisù at least once in an Italian restaurant, but I hope you will find that this tiramisù will be an even more intense sensorsial ecstasy for your palate.